Transform your laptop into a powerful workstation, with the help of docking stations from StarTech.com. Our docking stations enable workstation productivity without having to sacrifice the portability of a laptop. 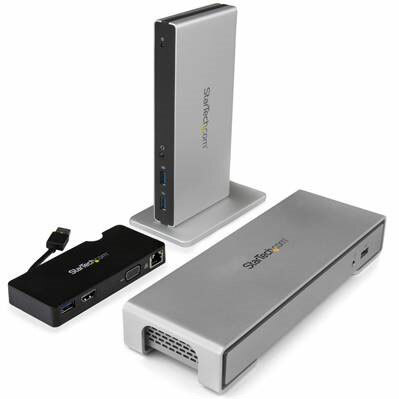 Through a single cable, users can easily connect their laptop to multiple monitors, Gigabit Ethernet and access all of their peripherals. Our comprehensive portfolio of docking stations provides easy out of box installation and offer solutions for all of your unique needs, regardless of the operating system or laptop brand. For docking solutions that offer convenience, compatibility and productivity, check out our selection below.